What Michael Vick has done thus far this season has been truly remarkable. Especially for a guy that never had the reputation for being a passer. Vick is currently first in the NFL in passer rating at 115.1. The biggest eye-popper is the fact that he has not thrown an interception thus far. He’s thrown 11 passing touchdowns. Vick’s completed 62.7% of his passes for 1,350 yards. For the past week, Vick has vaulted up everyone’s NFL MVP rankings with his amazing performance against Washington on Monday night. Vick became the first player in NFL history to throw for 300 yards, run for 50, throw for four touchdowns and run for two touchdowns in the same game. With all this now being said, I still want to see more out of Vick before I award him an MVP. The truth is, the Eagles have yet to face a formidable defense so far this year. Listed below are Vick’s starts this season. Let’s take a look, shall we. Vick did not start this game as Kolb left due to a concussion. Vick almost brought the Eagles back from 17 down on two occassions in the second half. Green Bay held leads of 20-3 and 27-10 respectively. Ultimately, the comeback bid fell short as Vick was unable to convert on a 4th and 1 with 1:54 to go. Vick went 16/24 for 175 yards and a touchdown through the air, and carried it 11 times for 103 yards. In some ways, I think this may have been on of Vicks better performances of the season. The Packers have been the best defense the Eagles have seen thus far. Philadelphia held on for the win 35-32. Vick was efficient, going 21/34 for 284 yards and two touchdowns. The Eagles took care of business in an impressive 28-3 win over the Jags. It was another efficient game for Vick, 17/31 for 291 yards and three touchdowns. He added a rushing touchdown as well. Vick left the game in the first quarter due to rib and chest injuries. He scrambled up the middle and dove head first inside the five-yard line and was sandwiched by two Redskin defenders. Vick was 5/7 for 49 yards. Kevin Kolb couldn’t muster the win off the pine for the Birds as Donovan McNabb came back to Philly with a 17-12 win. Vick would go on to miss the next three games. Michael Vick outdueled Peyton Manning as the Eagles picked up a 26-24 win over the defending AFC Champs. Vick got the job done with both his arm and legs. He went 17/29 for 218 yards and a touchdown passing, and rushed 10 times for 74 yards and a score. 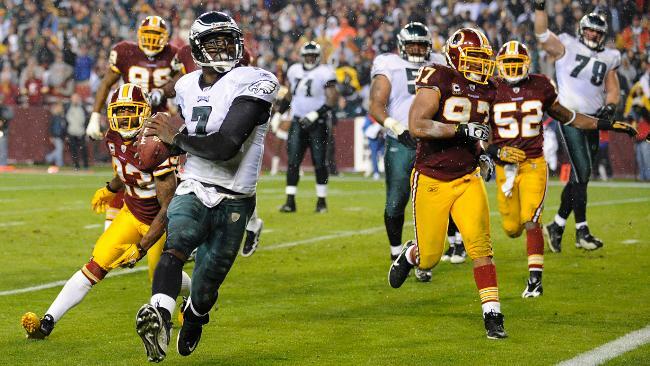 This is the game that got all the national attention and put Vick on the NFL MVP radar. Vick was simply incredible. You know the stats, 20/28 333 yards and four touchdowns passing, and eight rushes for 80 yards and two touchdowns. In the Eagles next two games, the Birds go up against two of the top defenses in football. They play the Giants at home tomorrow, and travel to Chicago next Sunday. Both defenses bring interesting dynamics. The Giants are first in total defense, while the Bears lead the league in turnovers. The Giants have arguably the best defensive line in the NFL led by defensive end Osi Umenyiora. It will be interesting to see how the G-Men contain Vick’s scrambling ability. The New York defense ranks fourth in passing, second in rushing and are first in total defense. The Bears are first in the NFL in takeaways with 25. Vick has yet to throw an interception this season. In all honesty, I don’t think I’ve ever seen Vick play the quarterback position this well in his career. Defenses are not able to play back and play the pass because Vick has shown so far that he can beat you with his arm. His mechanics have been spot on. I still remain baffled how a guy can spend 18 months in jail and just come back to the NFL and be BETTER than he was before.